This is my duct tape, hot glue and cardboard prototype which actually works. There is a cardboard ring around the base that turns the pin connected to the iris. 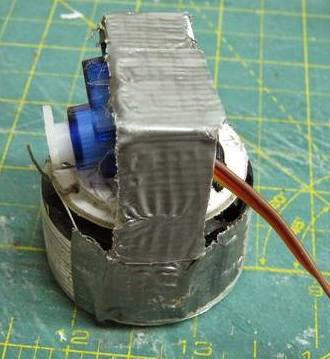 The servo motor glued on its side has a wire that connects to the ring. The servo motor, when it turns, then has enough movement to make the ring turn.